Welcome to Help for the Heart! My name is Robin and I’m a wife to Barry, mom to five boys, daughter, sister, friend, home school teacher, youth leader, and, well, you get the picture. I’m a busy woman. After being told for years I should write a book, I opted to try a blog. I have lived a life full of mistakes and calamity and I don’t regret one bit of it. I’ve learned valuable life lessons from every experience. Throughout it all, my one true constant has been my faith in a never-failing God. He has been loyal, faithful, and loving even though I don’t deserve it. I just know I bring Him more sadness and disappointment than anyone can imagine, but He loves me, supports me, guides me, and protects me anyway!! My hope for this blog is that you will find encouragement to live a life fully and completely devoted to Him while also juggling life. Life is not worth living without purpose, joy, passion, peace, and laughter, and love. Help for the Heart is here to help you find it! Hi Robin! It’s so funny that, as I’m reading through your blogs, I’m thinking — this woman needs to write books! Then I read your “About” page and the comment left by another user and find that I’m not the only one to think this. Your writing reads like an M.C. Beaton or a Sue Grafton “cozy mystery”. Light, fun, and interesting, with tidbits of inspiration and excellent “character” development. Plus it’s well written as is, with little or no editing needed. You never know, at some point in your busy life you may actually have time to blog an entire book into a micro-recorder. Just thought I’d let you know how much I enjoy your humor and resilience. Thanks for sharing! Thank you! That’s so kind!! You are a very special person Robin Wright! 🙂 Enjoying your blog so much!! I can’t tell you how much I enjoyed your blog! I am so proud. Love MOM! Thanks, Mom. I know you’ll always be my biggest fan! Many blessings going out to you and your loved ones. You have been nominated for the Versatile Award! 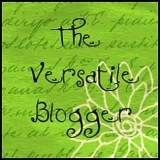 I enjoyed exploring your blog! I love your blend of humor, faith, and heart. I too am a homeschool mom. It’s always nice to encounter another. . . even in the blogosphere.